There was a box containing various applique blocks which I knew I wasn’t going to set into a quilt. So they sat and sat and sat. I finally decided to use them to make some large stitching books. 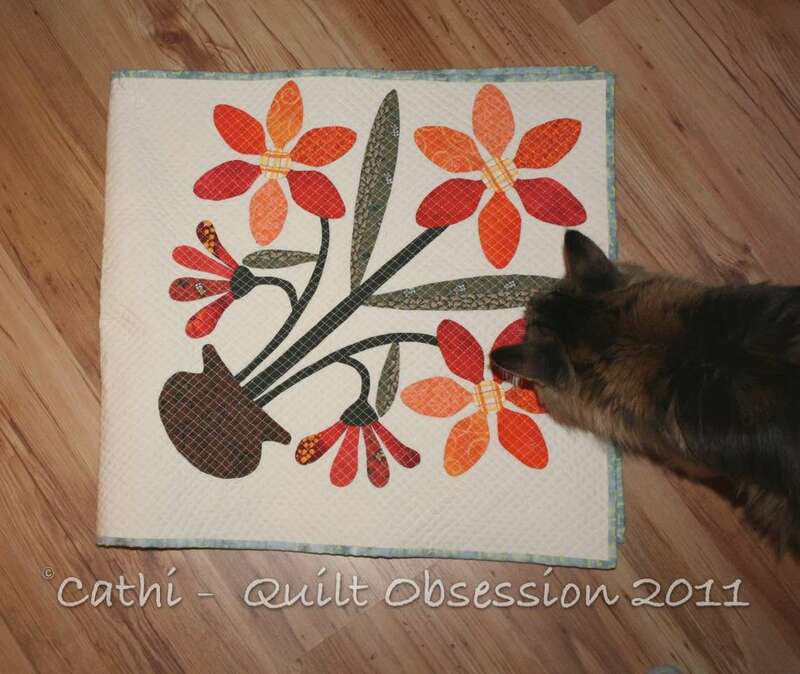 This one took two of the large applique blocks. 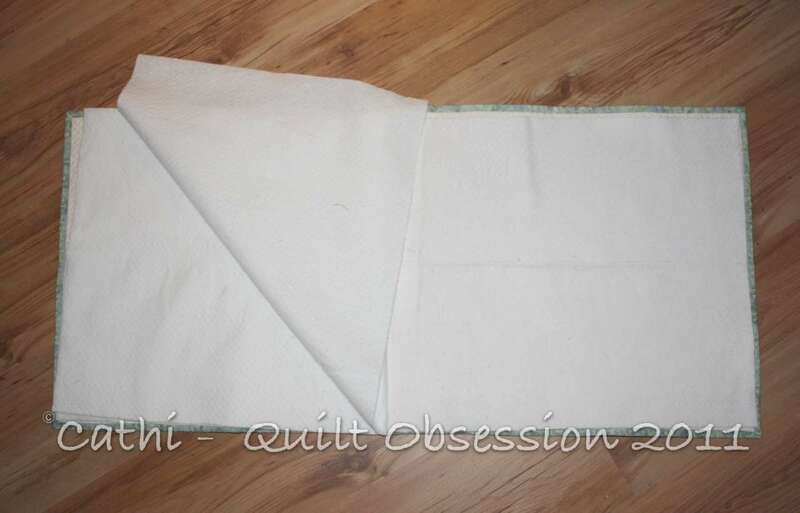 I added some batting, a backing, did some machine cross-hatch stitching, bound it and then cut 2 large pieces of batting which, when folded in half, turn into the pages of the stitching book and will be perfect to hold pieces of a block laid out ready to stitch. Smudge was determined to inspect both the front and back of the stitching book. The batting works well to hold the pieces of a block and, when closed, there’s no worry about them getting lost. When laying out a block like a Feathered Star or Sunflower for hand piecing, having a book like this is helpful. A friend who does much more machine piecing than I do assures me that a book like is helpful for machine piecers as well. Smudge was curled up, having a nap Sunday afternoon. We’ve found some different cat foods that he’s willing to eat. A wonderful to use up some orphan blocks! Your book looks lovely and so does Smudge. It’s good to see him curled up ! Great to see that Smudge is helping you out! Great book. Great to have you back! That is a great way to use those applique blocks! With all of the partial projects I have going, I would need 15 of those books. :) So many projects and not enough time! Good to see Smudge helping with the quilting ideas! You’re doing an excellent job of inspecting the stitching book. That cross-hatching is nothing short of amazing. Do the soft pages inside look like they might be comfy for a cat to snuggly on? Just wondering because I know you’re a very snuggly cat. I think its very important to have your feedback so thanks for putting forth the effort you good cat you!!! That is a great idea for some orphan blocks. Good to hear you are getting him to eat and it’s good to see him interested in your sewing. Great idea….yes, machine piecers like to lay out the pieces of some blocks too. Pretty applique blocks! Good to see Smudge helping you out, some projects need a kitty’s touch. What a smart thing to do!! Love it! Welcome back Cathi! What a clever idea, knew there was something that would make keeping the pieces handy for each block…and make good use of those orphan blocks lingering in boxes! Hugs, I know it still hurts…so glad you have Smudge to cheer you on and snuggle! Those are beautiful applique blocks! I think that to be a good idea. I’m in the process of making myself a stitching journal from wool. It’s a pattern from Maggie Bonanomi. I really love this idea! I can see how handy that would be for machine piecers too if there were lots of pieces in a block. It’s a great use for the orphan blocks too. What a great idea! I know I could have used them for the hobo quilt as I would cut out 10 blocks at a time. 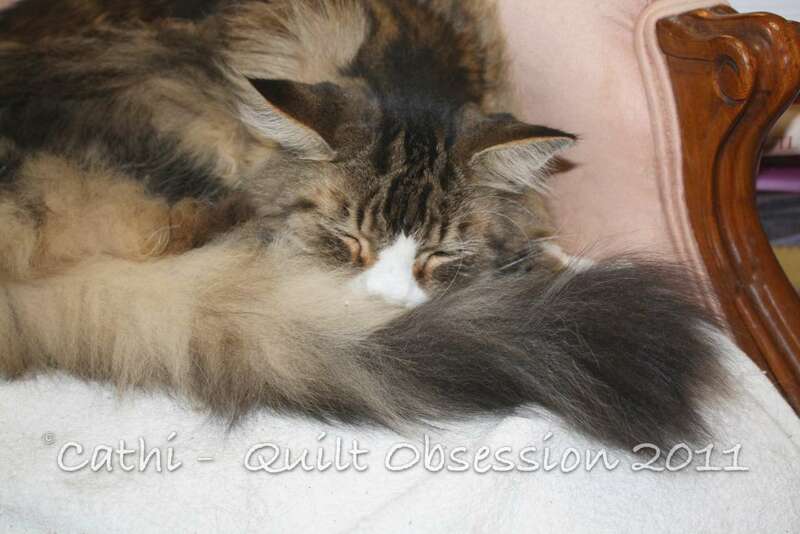 Hugs to Smudge and that wonderful tail of his. Beautiful stitching book – another thing for my ‘to do’ list! 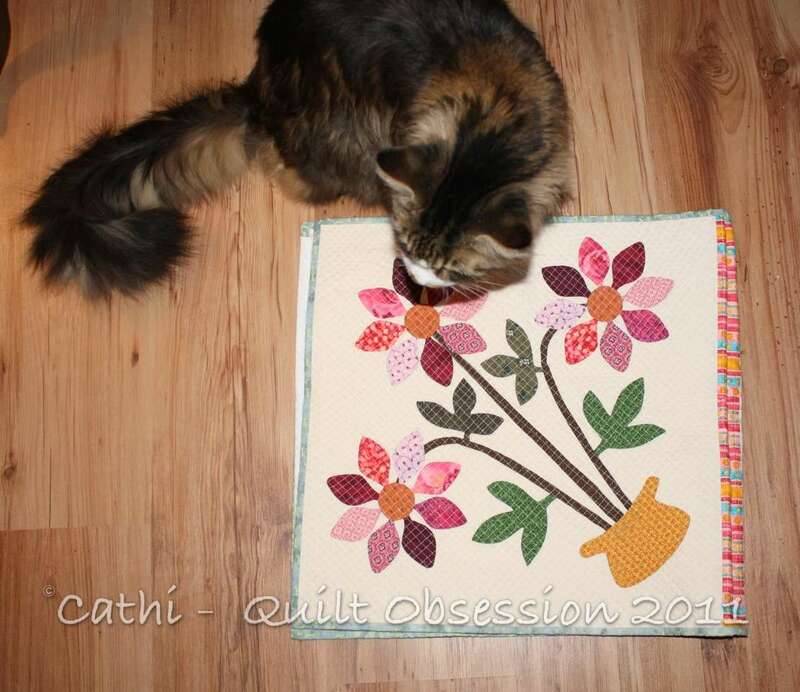 These are beautiful blocks Cathi and what a great way to use them up. Thank you for the tut on how to make them, I’m thinking I’ll have to make one for myself too 🙂 They would be great gifts too.